Although Mary Lou A. lives alone, she does not feel lonely, thanks to her Home Health Aide Peggy’s companionship, support, and love. 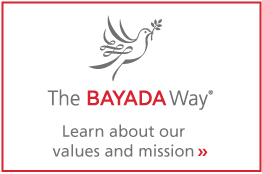 BAYADA Home Health Care voluntarily seeks accreditation from leading independent accrediting agencies. It’s one tangible way we demonstrate our commitment to providing home health care services to clients with the highest professional, ethical, and safety standards. CHAP, the leading accrediting organization for the home health care industry, has publicly certified BAYADA as voluntarily achieving the highest standards of excellence for home-based health care. BAYADA achieved accreditation by demonstrating compliance with CHAP national standards of excellence in the provision of care services. 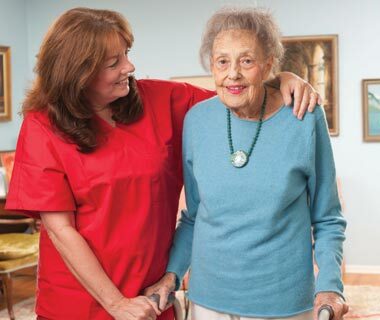 The rigorous CHAP accreditation process involves a thorough examination of the business and service aspects of the entire BAYADA Home Health Care organization — including office and client visits — in order to evaluate service quality, structural strength, organizational effectiveness, and human and financial resources. Our Habilitation Practice — which operates in North Carolina and Pennsylvania and serves adults and children with intellectual/developmental disabilities, autism, and other similar conditions — is accredited by CARF for community integration, respite, and personal support services since 2008, consecutively achieving the international organization's highest level of accreditation. CARF validated this BAYADA Home Health Care program for delivering services of the highest quality that are measurable and accountable to clients, their families, employees, and other stakeholders. Accreditation involves a rigorous peer review of business practices and program performance. This certification represents the highest level of accreditation an organization can achieve from this international accrediting body and represents conformance to CARF standards.